American Lawyer: "Bovard's take is ... a far more detailed and wide-ranging assault on the Patriot Act and the Bush administration, dense with example after example of governmental oppression, folly, and ineptitude in the wake of 9/11... Bovard is a superb reporter... He has apparently read just about everything published, in both the traditional and alternative media, about the egregious conduct of government officials, investigators, airport screeners, and bureaucrats everywhere in the last two years... Bovard offers far more than an infuriating record of government misconduct. His is a libertarian critique of any government's-including ours-inherent tendency to aggrandize and abuse its power." Karen De Coster, Mises Institute: "Jim Bovard is, without a doubt, the best political researcher-writer in politics today.... He provides an encyclopedia's worth of timely quotes laid out in chronological fashion, to funnel the reader through an extensive framework of US government double-dealing, coercion, corruption, and propaganda milling... Bovard has mastered the art of uncovering deception and spin when and where it is buried beneath a stack of establishment posturing, legally binding decrees, and walls of near-impenetrable propaganda." American Conservative: "No one is spared in Bovard's merciless review... Bovard's chronicle of the whole sad history of the war on terrorism, from Reagan to Bush I and through the Clinton years, is a tale of appalling incompetence." (Justin Raimondo, September 22, 2003). 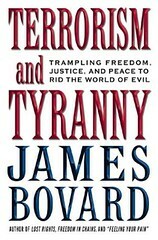 LP NEWS: " Terrorism and Tyranny is not just the best book you'll ever read about the War on Terrorism. It's not just the best Libertarian book of the year. It's one of the most important books of the decade. Whether you support or oppose the War on Terrorism, you owe it to yourself to read it." (Bill Winter, December 2003).